As far as I know, Gleim EA Review is the most popular enrolled agent course. Gleim is also the Preferred EA Review Provider of the NAEA, the National Association of Enrolled Agents. Additionally, many of my readers consider Gleim EA Review to be the best enrolled agent review course around. And when you click the discount links below, you can save big on Gleim EA Review (the savings will appear in your cart). Disclosure: The I Pass Team may earn a small amount of compensation if you purchase from our links; our team uses these revenues to maintain the site and produce awesome free content just for you! So, what’s special about the Gleim EA Review products and services? Let’s take a look. 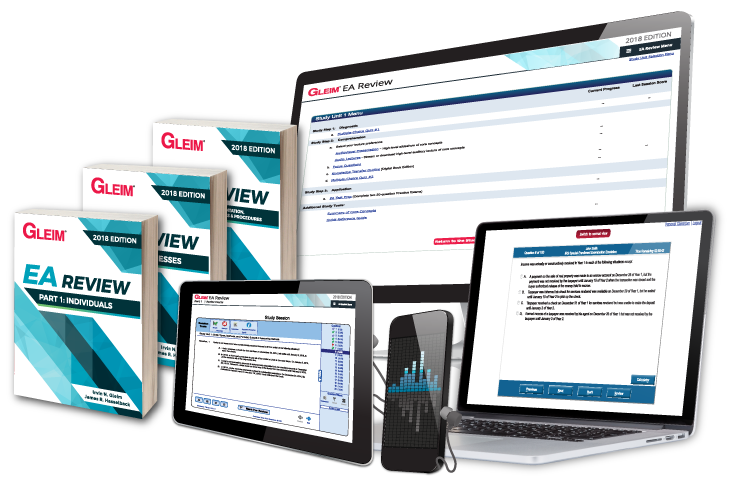 The Gleim EA Review System has all the tools and features you need to pass the EA exam. Textbook: An expertly-authored book comes with the courses for all 3 exam parts. Test bank: The courses for all 3 exam parts also include access to a test bank containing more practice multiple-choice questions than any other course. Online platform: This tool guides candidates through the self-study process while providing a personalized study planner and performance tracking and diagnostics. Audio-visual presentation: These visual lessons cover the core concepts in each study unit. Audio reviews: The audio lectures are available for streaming or download for study convenience and flexibility. Mock exams: The practice exams recreate the look and feel of the real testing environment so you can be completely comfortable by exam day. Personal Counselors: These exam mentors are real people you can talk to for exam and study support. Accounting experts and technical support: These knowledgeable teams also help you work through concepts you don’t understand or difficulties with using the course. Dr. Irvin Gleim is Professor Emeritus at the University of Florida and a respected educator in the field of professional accounting certification exams. He launched his first review course more than 40 years ago and, for a time, authored the popular CPA review book now known as Wiley CPA Exam Review. The Gleim brand also encompasses several other accounting and tax qualifications, including CMA, CIA, EA, and AFSP. Team Gleim prides itself on helping students learn how to study on their own and really learn the foundational concepts rather than quick tricks and mnemonics. Additionally, the National Association of Enrolled Agents (NAEA) endorses Gleim EA Review. Gleim uses the same integrated learning approach for all of its review courses. While cohesive courses are quite common offerings in the CPA review industry, they are pretty unique among EA exam prep materials. However, Gleim EA Review puts an online study planner, audiovisual lessons, audio reviews, a test bank, performance tracking, and access to a Personal Counselor all in one convenient package. Gleim EA Review really sets itself apart with its numerous signature questions. Furthermore, the Gleim test bank has a reputation for being fairly challenging because it mixes in questions from the other Gleim accounting exam prep courses. That practice may sound intimidating, but it is actually a great preparation tactic. Would you rather develop your ability to effectively think on your feet or risk letting out-of-the-blue questions catch you off guard on the exam day? On top of everything else, Gleim EA Review is confident enough to offer both a free trial and a pass guarantee. The free trial is among the most generous: full access to one study unit for 18 months. Plus, the pass guarantee ensures that your materials stay up to date and always available for as long as you’re studying. Because of all the features, Gleim demands a higher price. However, this is understandable, and the course is still a good value. Some readers have said they find the outline style of the Gleim books a bit hard to read. But thankfully, most candidates don’t need to rely on the books because the rest of the tools are sufficient for learning the exam content. The books really serve as more of a reference. I have been watching out for comments on Gleim and other EA review course providers for some time now. And according to my research, Gleim is the only course that consistently gets good reviews. That’s right: so far, I haven’t read a single negative comment about Gleim EA Review, either from my readers or on the various forums out there. So, if you are serious about finishing the EA exam and aim to pass on your first try, Gleim EA Review is your best bet. Get an instant 15% off the Premium Gleim EA Review! Plus, save 10% on individual Premium parts (Gleim EA Review Part 1, Gleim EA Review Part 2, or Gleim EA Part 3). There’s no need for a discount code: just click the button, and the discount will automatically appear in your cart!